Brooke Bennett works inside for a lay-up attempt in her team’s win over MG Saturday afternoon. 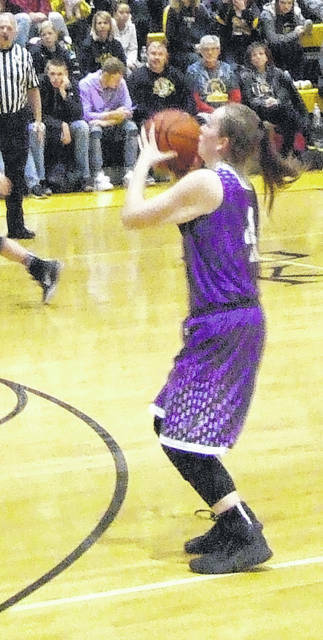 Mount Gilead’s Dakota Shipman prepares to launch a long-range shot at Northmor Saturday. 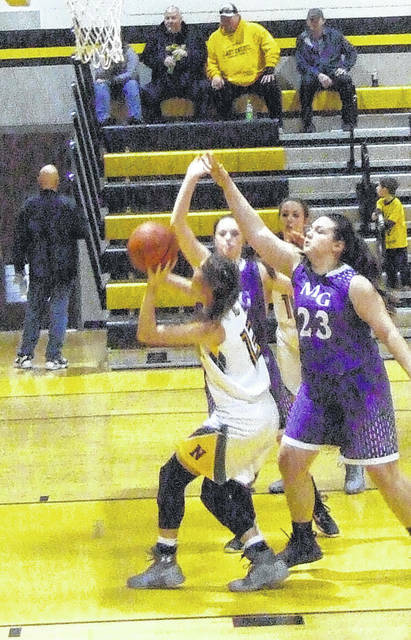 Northmor’s girls’ basketball team posted a defensive gym against visiting Mount Gilead Saturday afternoon in taking a 43-14 win. The Knights held an 18-10 lead after a low-scoring first half, but dominated the third quarter in outscoring their guests 17-0 to pull away for the convincing win. Northmor head coach Fred Beachy noted his team wanted to prevent MG’s Madison Fitzpatrick from taking over the game, as well as avenge an earlier loss to the Indians. The second match-up between the teams was tied at four after three minutes, but Northmor was able to shut down the Indians for over eight minutes. Over the rest of the first quarter, the Knights got four points from Addie Farley and two each from Leslie Brubaker and Macy Miracle to jump ahead by eight. Another shot from Farley made it 14-4 early in the second period. The Indians weren’t able to hit from the field in the quarter, but did connect on 6-of-8 free throws, with Holly Gompf tallying three of that total, to stay within eight points entering the half. However, their drought continued throughout the third, as they were unable to score from the field or get to the line. Northmor had no such trouble lighting up the scoreboard. Brooke Bennett opened the period with a pair of baskets and with the score 24-10, Cristianna Boggs scored nine straight to help them take a 35-10 lead into the final period. Beachy was pleased with how his team played on its Senior Day, noting that they did a good job of focusing on the game itself. After finishing off MG, the coach was hoping they could finish the regular season with some momentum. Boggs led Northmor with 11 points, while Bennett added nine and Farley scored eight. Mount Gilead got four each from Fitzpatrick and Samantha Sullivan. https://www.galioninquirer.com/wp-content/uploads/sites/38/2018/01/web1_brookebennett.jpgBrooke Bennett works inside for a lay-up attempt in her team’s win over MG Saturday afternoon. https://www.galioninquirer.com/wp-content/uploads/sites/38/2018/01/web1_dakotashipman.jpgMount Gilead’s Dakota Shipman prepares to launch a long-range shot at Northmor Saturday.